Arash Rahmanipour, one of the two victims executed today, was only 19 years old. He was arrested in March/April 2009 two months before the fraudulent elections in June which has led to protests throughout Iran since. Yet today the junta administration's prosecutor, inconsistent as ever like bad liars always are, said Arash Rahmanipour was executed for his role in the Ashura protests. Presumably the 19 year old Arash was directing the Ashura protests from his cell while he was being interrogated! What Arash was accused of, contacts with a terrorist group outside Iran, was supposed to have happened when Arash was a minor and under 18 years old. Even under Islamic Republic penal code, the punishment for contacts with terrorist groups is not death but prison sentence. 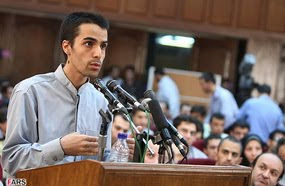 Arash was arrested along with his family members. His pregnant sister was also arrested and was frequently put in the same room with Arash when he was being interrogated. His father was also threatened that if he did not persuade his son to sign the confessions, he too would be arrested. Arash's father was also misled to think if Arash does sign the confessions all family members would be released. Even though Arash's charges were nothing to do with the post-election protests, he was bundled in with the rest of the accused in the mass show trials that make Stalin look like Mother Theresa. In his televised recants it seemed obvious that Arash was reading from a text. He may have even given a clue within the narrow margins he had, when he referred to London as the 'country of London'. His lawyer Nasrin Sotoudeh, who has exposed much of the above points said she was given 15 minutes only to meet her client and review his file, where she saw no evidence of any of the charges made against him. She was not even allowed to be present during Arash's show trial. The judiciary process for the appeal had not yet come to an end and Arash's family were never notified about the execution. They first heard about the execution of their loved one on the news. Great piece. Very informative. Thank you. Nice job on AlJazeera Potkin. Very welll said. I just got sent a message on Facebook...apparently there's going to be a protest tomorrow outside the Embassy against these executions...6-8PM. Well done, well said, Potkin! you lie on TV like it's your job! either way, i can't wait to celebrate the anniversary of the revolution coming up next week! You're an idiot, eat your heart out that Obama is president of the US! Since you said you don't have a $1000 for charity on our bet, how about $100, or maybe even $50, we can donate it to the victims of Haiti if you like, or wait, let me guess, you don't have that kind of money right ,because you're a student! totally in line with Ahriman's commands, feeding the snakes. interesting that an sick hezbollahi like SZ now feels that he has to riposte the comments of so many others. The tide has turned for the cut throats that support the inhuman fascist Islamic Republic. Your days SZ as a political jakesh are numbered. I will not engage in any bets or financial transactions with supporters of state sanctioned murder.